Discover how to implement practical typography techniques to make your site responsive with this free ebook. Typography is an essential part of any website’s design. It can help you stand out from the crowd, communicate with clarity, and cultivate a distinctive identity. If you want to get stuck in with responsive typography, there’s no substitute for getting stuck in and just doing it. That’s why Packt are offering Creative Bloq readers a free download of its book Practical Responsive Typography by Darlo Calonaci, a published author and designer who has worked for Gucci and Calvin Klein. Practical Responsive Typography demonstrates how to use typography to greatest effect – from scaling and optimising screen spaces to using a range of different web fonts, you'll quickly get up to speed with the practical considerations behind successful typography. You’ll also find out how to go further by customising typography designs to suit your identity. 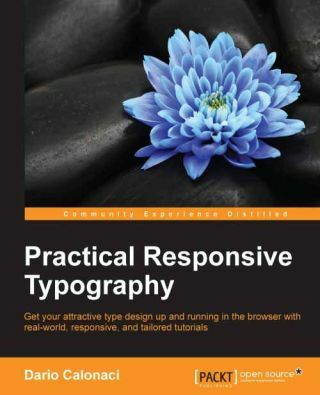 Get your free copy of Practical Responsive Typography here.